Just imagine the comfort of a classic risotto. 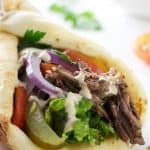 Warm, creamy, earthy and delicious! That is a perfect description of our creamy Butternut Squash Risotto. 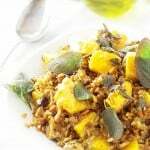 Bacon, a little white wine, fresh herbs, aromatics and pureed butternut squash will transform rice into an elegant dish. Do not believe those old tales that risotto is difficult to make and takes hours to cook. It is not true. And you do not need to stand at the hot stove stirring constantly either. Frequently, yes but not constantly. There are many variations of risotto. 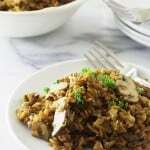 One of my personal favorites is a fresh mushroom risotto with it’s pronounced earthy flavor. But this creamy butternut squash risotto is by far the first place winner. Risotto is another wonderful dish from the Italians. It is a traditional rice-based dish made with a starchy, short grained rice. 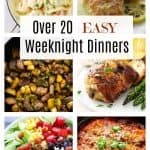 They have been cooking risotto for eons and can complete the process in twenty minutes flat. We, however, do not cook risotto on a regular basis and are not quite so quick as the Italians but it still will be completed under thirty minutes. 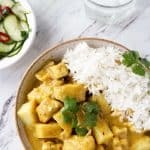 The method involves stirring the rice while adding small portions of hot broth and letting it absorb into the rice grains before adding additional broth. Stirring the rice after each addition of liquid causes the rice to release its starch and developes the creaminess we love. What Kind of Rice Is Best For Risotto? Arborio rice is the most available rice in north America and what we see in our supermarkets. It has a wider and longer grain than carnaroli and vialone nano. Also, it is less starchy and does not absorb liquid as well. Carnaroli is the king for risotto rice. It is the preferred risotto rice in most regions of Italy with the exception of the the Veneto region. Some believe that this rice produces the creamiest risotto. The Veneto region prefers vialone rice. Vialone nano can absorb twice its weight in liquid. This rice has almost as much starch as the carnaroli and produces a very creamy risotto. Both carnaroli and vialone nano are not usually found in our supermarkets. You can buy both of these Italian rice in specialty markets and online. 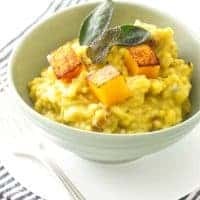 Is This Butternut Squash Risotto Freezer-Friendly? 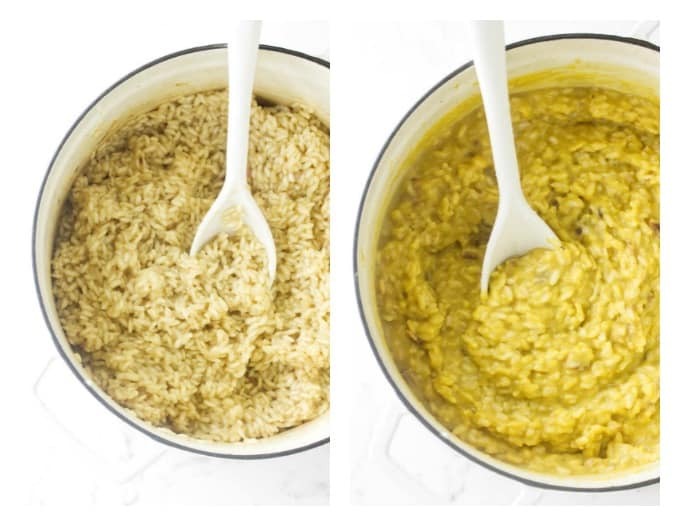 Yes, you can freeze risotto but it will have texture changes and will not be quite as creamy and tasty. 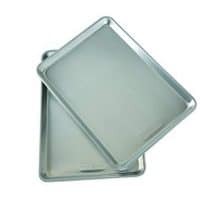 Once the risotto has cooled but still warm, transfer it into a sealable plastic container and pop it into the freezer. When ready to use the frozen risotto, let it thaw overnight in the refrigerator. Reheat risotto in the microwave, stopping and stirring often. You can also reheat it on the stovetop in a non-stick skillet. Either way you choose to reheat, add a little water, broth or wine stirring to bring back some of the original texture and creaminess. Roast up three cups of cubed butternut squash and after they have cooled set half a cup aside. Puree the remaining cubes in the food processor. Stir in a little cream and reserve. Next, heat the chicken broth in a saucepan on a back burner and let it simmer the entire risotto making process. You will want to cook the risotto in a large pot with a heavy bottom. We used our Dutch oven. This makes a large batch of risotto as the cup and one-half of rice will double in volume. 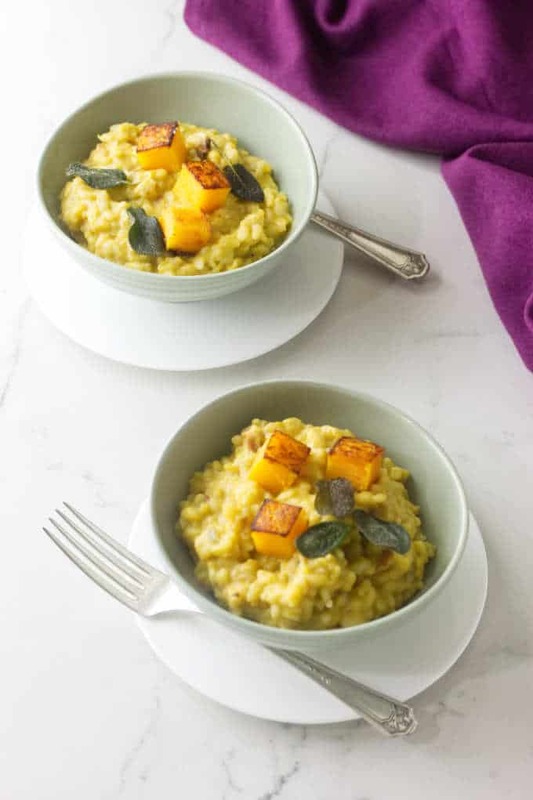 Now is the time to call your friends for a butternut squash risotto party! Fry the bacon, sauté the shallots, garlic and fresh sage leaves. Then add the rice and toast it up a little. Pour in the wine and stir a couple minutes until it gets absorbed into the rice grains. Next, add a half-cup ladle of that hot chicken both. It should just barely cover the rice. Stir the mixture frequently with a wooden spoon so the rice keeps moving and doesn’t stick to the bottom. Be sure to keep the heat to a medium as risotto is best cooked slowly over a low heat to get that creaminess we love. How Long Does It Take to Cook Risotto? Continue this process of adding broth while stirring to absorb until there is a creaminess to the rice. Stop and taste it now and then to see if the rice grains are tender. They should be a little bit firm, al dente is what we are looking for and a creamy texture. This procedure will probably use all of the hot broth and take about 20-minutes. Oh, boy! 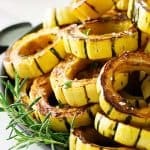 Now is when you add the finishing touches with the pureed squash and grated Parmesan cheese. Just stir them in gently until well combined then remove from the heat while you fry up the sage leaves for garnish. 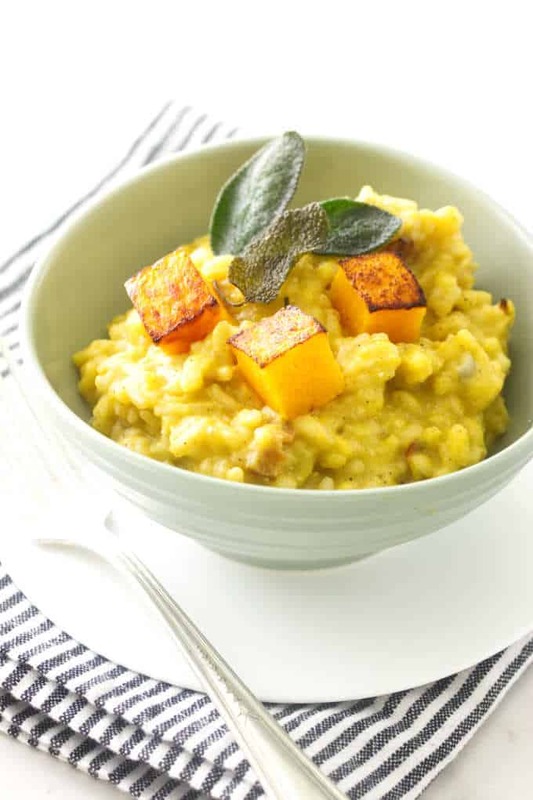 Transfer the risotto to your prettiest bowl, garnish with the reserved squash cubes and the fried sage leaves. Serve and enjoy! Butternut Squash Risotto! Warm, creamy, earthy and delicious! Made with bacon, white wine, fresh herbs, aromatics and pureed butternut squash. In a large bowl, add the butternut cubes and toss with the olive oil. Spread the cubes on a sheet pan and sprinkle with salt and pepper. Transfer to the oven and roast for 20 minutes. Remove from the oven and cool to room temperature. Transfer 1/2 cup of the roasted cubes to a dish and reserve until needed for garnish. Add the remaining cubes to a food processor and purée. Transfer to a dish and stir in the cream, cinnamon and nutmeg until well combined. Reserve until needed. Pour the chicken broth into a saucepan, bring to a boil then reduce the heat to low and simmer. Add the bacon to a heavy bottomed pan set over medium heat and cook until crispy. Transfer to a paper towel-lined plate and drain. Pour off all but 3 tablespoons of the bacon fat and add the chopped shallots and cook for 3 or 4 minutes, until translucent and soft but not brown. Add the garlic and cook 30 seconds until fragrant. Stir in the chopped sage. Reduce the heat to medium-low and add the rice, salt and pepper. Stir frequently, so the rice is coated with the bacon drippings and begins to toast slightly. Add the white wine and let it absorb into the rice, then add a 1/2 cup ladle of hot chicken broth. The chicken stock should just cover the rice. Cook the rice, stirring frequently but not constantly until the liquid has absorbed into the rice, about 5-8 minutes. Repeat this process of adding ladles of broth until the rice becomes al dente. Stir in the butter, lemon juice, reserved butternut purée, bacon and the Parmesan cheese. Reduce the heat to low and cover while preparing the fried sage leaves. 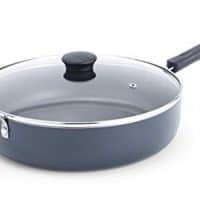 In a small skillet set over medium-high heat, add the olive oil and when hot carefully, using tongs, add the sage leaves and fry for 15 seconds, turning with tongs or slotted spoon. When crispy, remove from the hot oil and drain on a paper towel-lined plate. 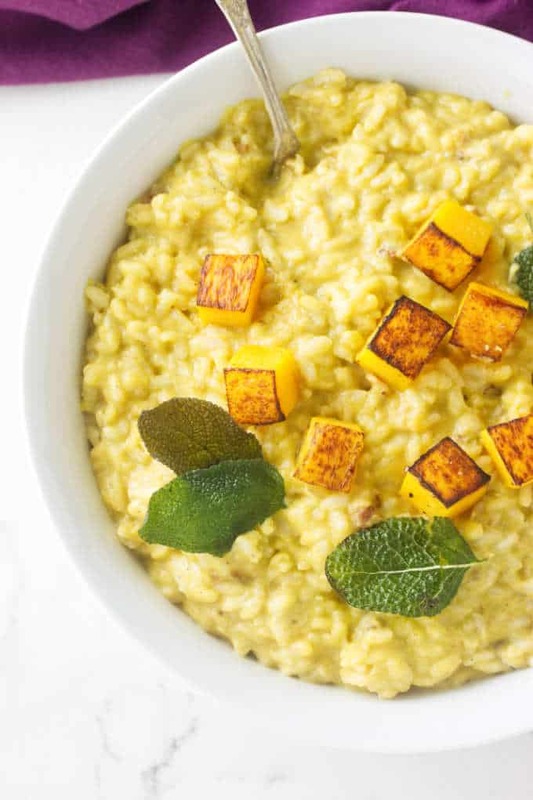 Divide risotto equally into 4 serving bowls, add cubes of the reserved roasted butternut cubes and garnish with the fried sage leaves. Serve immediately. The squash will be thick and it may help to add a small amount of chicken broth to get it smooth. The chicken broth should be hot but it is not necessary to boil it. Just let it simmer on a back burner. Be cautious when frying the sage leaves as the moisture in the leaves will cause the hot oil to spit and sputter. For safety, use tongs to add and remove the leaves. Do not use extra virgin olive oil to fry the sage leaves, it has a low smoke point. You can use light olive oil which has a higher smoke point or use peanut oil or avocado oil. Risotto will keep in the refrigerator for about 3 days. Risotto is freezable but the texture will change and the rice will have a bit of a grainy texture. 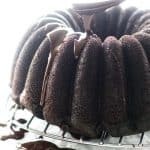 Let it thaw overnight in the refrigerator. Reheat risotto in the microwave, stopping and stirring often. You can also reheat it on the stovetop in a non-stick skillet. Stir and add liquid to return to creamy texture. Yum! This risotto looks amazing! LOVE risotto! And really like how you can use so many different things to flavor it. I’ve had risotto made with squash in restaurants, but never made it myself for some reason. But now with your terrific recipe, I will. Thanks!